﻿ BATTLE ROYALE: THE NOVEL « Haikasoru: Space Opera. Dark Fantasy. Hard Science. In an alternative totalitarian Japan, junior high school students are sent to an island and forced to slay one another for the glory of the regime. But this time, last year's "winner" Shogo Kawada is playing the game again! Will he and his friends--the clever jock Shuya Nanahara and kindhearted Noriko Nakagawa--survive the game, or will they be slaughtered by a psychotic classmate who is playing for keeps? Battle Royale is….comin’ at ya! Koushun Takami was born in 1969 in Amagasaki near Osaka and grew up in Kagawa Prefecture of Shikoku, where he currently resides. After graduating from Osaka University with a degree in literature, he dropped out of Nihon University's liberal arts correspondence program. From 1991 to 1996, he worked for the prefectural news company Shikoku Shihnbun, reporting on various fields including politics, police reports, and economics. Battle Royale, completed after Takami left the news company, was rejected in the final round of a literary competition sponsored by a major publisher due to the critical controversy it provoked among jury members. 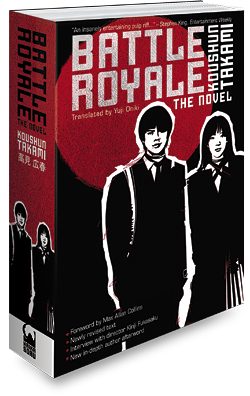 With its publication in Japan in 1999, Battle Royale received widespread support, particularly from young readers, and became a bestseller. In 2000, Battle Royale was serialized as a comic and made into a feature film. Kazuo said, “Listen.” Mitsuru stopped again. Although Mitsuru clearly heard him, he kept on blinking. He didn’t understand what Kazuo meant. He tried to read Kazuo’s thoughts from the expression in his eyes, but they just calmly shone in the shadow over his face.